We are establishing a successful, effective and friendly express Payment System for people on the go. The program aims to provide an opportunity to franchisees a fast-start profitable business without big operational expenses thru our Payment System. TouchPay™ is a duly registered corporation in the Philippines since 2011 that launched a network of Automated Payment Machines (APM™) all over Metro Manila. TouchPay™ accepts payment services in behalf of our clients – private businesses, government agencies, merchants, insurance companies, banks, and other service providers. TouchPay™ is the pioneer in express payment system in the Philippines. It started in 2011 with nothing more than an innovative spirit and a unique concept. The choice of location considers the amount of foot traffic and the security of the area to provide great convenience to the largest number of people. 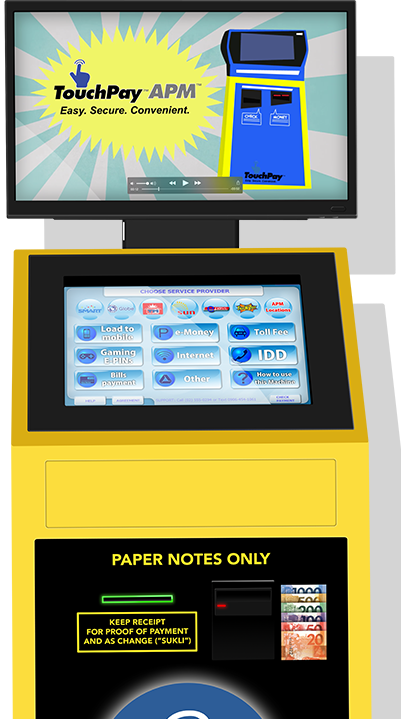 TouchPay APM requires a space size of less than 1sqm., an electrical outlet, and a dependable cellphone reception. APM power supply is 220v with monthly consumption (max: 300w) of Php350-Php500 on a 24 hours operation. Eliminate the need for manpower while being assured to have continuous operations 24 hours a day, 7 days a week – even on weekends and holiday breaks without incurring additional cost. We provide you with a weblink so you can monitor your sales real-time, anytime and anywhere. Step by step procedures so you can grab your own franchise now. Site Evaluation for APM deployment.